F.M. proposes itself as a technical partner in the study, design and implementation of technical articles of thermoplastic materials, because it has always addressed to technical and technological development and to the continue trial of new technopolymer: these quality enable us to be a company “Moving with times “. 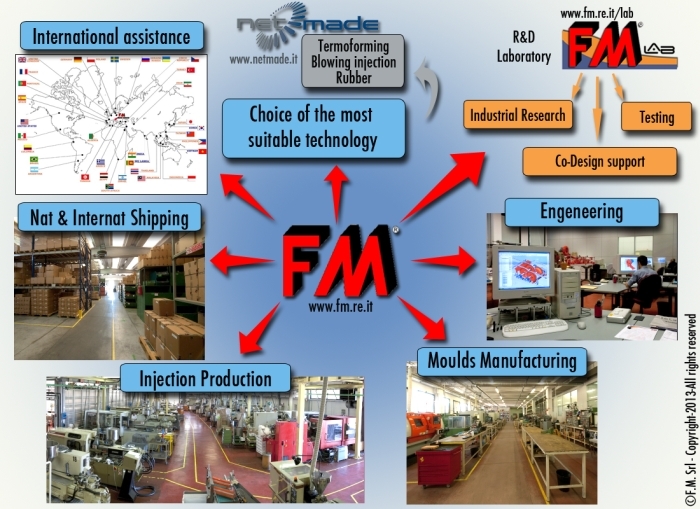 All necessary operations to create a new article in thermoplastic material are conducted within the Company: FM is able in fact to design the piece and equipment to produce it, built the mould, and ensure its maintenance throughout its life cycle, produce the finished piece and ensure an adequate post-sales service. All this allows us to warrant the customer a strict confidence in the development of new projects. The Quality of all FM processes is guaranteed by a system of quality controlalready certified since 1995, quality that rewards the policy of continuous improvement that the Company and its collaborators have always pursued. Furthermore, in January 2008, with Executive Decree n.4/Ric, published on the Official Journal n.26, 31st January 2008, F.M. obtained another important recognition by the Ministry of University and Research: the insertion between laboratories accredited by M.I.U.R.